Researchers from the Hebrew University of Jerusalem and the US have discovered the mechanism whereby dangerous mercury eventually finds its way into the fish we eat from the open seas and oceans. Fish and shellfish concentrate mercury in their bodies, often in the form of methylmercury, a highly toxic organic compound of mercury. Fish products have been shown to contain varying amounts of heavy metals, particularly mercury and fat-soluble pollutants from water pollution. Species of fish that are long-lived and high on the food chain, such as marlin, tuna, shark, swordfish, king mackerel, tilefish, northern pike, and lake trout contain higher concentrations of mercury than others. The presence of mercury in fish can be a health issue, particularly for women who are or may become pregnant, nursing mothers, and young children. The researchers, Prof. Menachem Luria from the Fredy and Nadine Herrmann Institute of Earth Sciences at the Hebrew University and Dr. Daniel Obrist of the University of Nevada, found that "passive" mercury normally found in the atmosphere is converted into an "active," oxidized form in the presence of bromine. The passive mercury is generally non-transferable, whereas the active form is readily absorbed into the environment. The air over the Dead Sea was chosen for the experiments on mercury oxidation – even though it does not contain any fish – since it has unusually high levels of bromine that is emitted from the surface into the atmosphere, converting the mercury there into the oxidized mercury. "In the world generally, the amount of oxidized mercury in the atmosphere constitutes about one percent of all the mercury in the atmosphere," said Prof. Luria, "while above the Dead Sea the oxidized mercury often amounts up to about 50 percent." In fact, the bromine in the air over the Dead Sea is 200 times greater than over other bodies of water, say the researchers, due not only to the high level of bromine present on the surface but also to the high rate of its evaporation into the atmosphere because of the very high temperatures there. It is important to note, they emphasize, that this process of conversion of passive into active mercury occurs over all bodies of water, even though it may be at much lower levels than at the Dead Sea. Although health officials in the world have issued warnings from time to time about the danger of mercury found in fish, the process by which the inactive mercury is converted into the active, oxidized form was previously unknown. The current research has now revealed how this occurs, with the resultant introduction of this dangerous, active form of mercury into the fish food chain and ultimately into humans through the consumption of sea food. . The research by Prof. Luria and Obrist was supported by the National Science Foundation of the US, and the results were published in Nature Geoscience Journal. This is the latest of numerous research projects conducted in the Dead Sea area, which serves as a natural laboratory for a long list of biological-chemical and geophysical research projects, commented Prof. Luria. Larry Gilbert got hooked on observing butterflies when he was a just a kid. "I found a chrysalis of a black swallowtail in a lot near our house. I raised it in a Coke bottle in the window, and have been interested in butterflies ever since," says Gilbert, a professor of integrative biology at the University of Texas. In a rooftop greenhouse on the Austin campus, where he has worked since 1971, and as director of the 82-acre Brackenridge Field Lab just a few minutes away, Gilbert focuses much of his research on Heliconius butterflies. From the southern United States south through Mexico, Central and South America, these tropical butterflies have a huge variety of color patterns. Their dazzling array of colors is primarily to warn predators that they taste bad, so local birds learn to avoid them. "The color pattern is a complex of two forces, the anti-predator force, which is probably the predominant thing, but the details may involve the selection of the right mate," says Gilbert. "Heliconius are not just beautiful, they are smart in the sense of having flexible behavior," continues Gilbert, as he points out several butterflies on passion vines in the campus greenhouse. "So in nature, they can learn the position of these flowers and return to those on a regular basis. This was stuff I worked on as a grad student. If you put numbers on their wings, they are able to cruise around and show up at the same little inconspicuous flower at the same time every day. They run a very complicated route in the forest, and then they go roost in the same place every night. " By being so efficient in finding food sources, Heliconius can expand their lifespan from a month and a half to six months. That also means they can extend their reproductive output from about 200 eggs in their lifetime to about 2,000 eggs. With support from the National Science Foundation (NSF), Gilbert and his colleagues are studying a population of Heliconius that they think is in the process of evolving into two distinct species. It's known as "speciation" when one species branches into two that no longer interbreed, and for Heliconius, the process involves those color patterns. While evolution is unfolding all the time, it is rare for scientists to be able to observe it up close, as they are doing now with a population of Heliconius in Ecuador. The simplest reason for a split in any family tree is geography, explains Marcus Kronforst, who worked with Gilbert on Heliconius studies and is now at Harvard University. "So we are used to, say, a mountain range coming up and splitting a formerly interbreeding population into two. The individuals can't make it over the mountain so they are separated on the two sides," explains Kronforst. "They spend maybe millions of generations like that, and over time they become so different that even if the mountains disappear, or if it is a river splitting them, if that disappears, and they come back into contact, they can no longer interbreed." But with the Ecuador population, these biologists are seeing something different. "So what we are finding is the butterflies shift their color pattern to avoid predators, but it has this secondary consequence of causing them to no longer recognize each other as potential mates, and we think, actually causing speciation," says Kronforst. In Ecuador, the scientists observed that yellow and white butterflies of the same species live and mate with each other. But when studying them in captivity, the biologists discovered an interesting twist. "There is an incipient process going on there, where the yellows are preferring yellows, but the whites are not caring much about which color it is," says Gilbert. "So, it's an initial step in the direction of correlating color with mate preference, which under some circumstances could lead to speciation." They have been comparing the Ecuador butterflies with some of their close cousins in Costa Rica where the two different colored butterflies are actually two different species. "In Costa Rica, they are genetically different and we can tell them apart," says Kronforst. "But in Ecuador, the only place on the whole genome where they are different is the gene that causes color, because everywhere else that we look, genetically they are exactly the same." Gilbert says there are thousands of color patterns possible from Heliconius hybrids, and sometimes the offspring don't look like either mom or dad. Evolution may have hidden some of those patterns. "So basically, what we're talking about here are patterns that in the course of the evolution have been replaced. But they haven't been done away with totally. And so, it's very much like a window on your computer that is now not being shown on the screen, but with the click of a mouse, you can show it on the screen," says Gilbert. As director of the Brackenridge Lab, Gilbert oversees butterfly research but also a wide array of other biological studies. "This is some serious nature," he says, as he points out one of the large ponds at the field lab. "We have everything from fire ant research, to frogs, butterflies, snakes, vegetation studies, and biofuel studies." At Brackenridge, there is a large butterfly greenhouse, an open habitat designed as a breeding "free for all." "So the butterflies that are out in the open in here are ones that are in an active hybrid zone. And so, it's just allowing it to cook along, and generate whatever variety might come about," says Gilbert. Along with his butterfly studies, Gilbert has also been studying invasive fire ants for several years. They are a costly problem for Texas farmers and ranchers. Huge populations of these non-native fire ants, originally from South America, have been attacking livestock, small birds, mammals, and reptiles across the south for decades. They have also caused electrical fires by getting into circuit boxes. Gilbert has been using phorid flies as a possible natural way to control the invasive ants. These female flies inject an egg into the fire ant's body. The injected egg develops in the ant's thorax, killing the ant in about ten days. In some areas the flies are being integrated into the more common pesticide control of the ants. The Brackenridge lab is a mecca for environmental biology, ecology and evolution studies. "It's also a place where faculty can set up research projects, such as this shelter for native switchgrass for biofuels study," Gilbert says, showing off some new growth. Graduate students or teaching assistants on campus can set up and monitor experiments, and some faculty members do some of their teaching at the field lab. "Having a facility like this where undergrads are initiating research enables us to put students onto gathering data that would not otherwise be funded or supported," notes Gilbert. Fear of free radicals may be exaggerated, according to scientists from Karolinska Institutet. A new study, published in The Journal of Physiology, shows that free radicals act as signal substances that cause the heart to beat with the correct force. Free radicals are molecules that react readily with other substances in the body, and this can have negative effects on health in certain circumstances, through the damage caused to cells. Free radicals can be counteracted by substances known as 'antioxidants', which are common ingredients in many dietary supplements. The idea that free radicals are generally dangerous and must be counteracted is, however, a myth, according to scientists who have conducted a new study of the role that free radicals play in heart physiology. "As usual, it's a case of everything in moderation. In normal conditions, free radicals act as important signal substances, but very high levels or long-lasting increases can lead to disease", says Professor Håkan Westerblad, who has led the study. When the body is subject to different types of stress, the sympathetic nervous system stimulates receptors known as beta-adrenergic receptors on the surface of heart muscle cells. This leads to several changes inside the cells, one of which is the phosphorylation of proteins. This leads to the contractions of the cells becoming stronger and the heart beats with greater force. In the current study, the scientists show that stimulation of the beta-adrenergic receptors also leads to increased production of free radicals in the mitochondria of the cells, and these then contribute to stronger contractions of the cells. When the scientists exposed the cells to antioxidants, a major part of the effect of beta-adrenergic stimulation of the heart muscle cells disappeared. The results reveal a previously unknown regulatory mechanism of the force production in the heart, and may lead to a better understanding of various types of heart deficiency. "Free radicals play an important role, since they contribute to the heart being able to pump more blood in stress-filled situations", says Håkan Westerblad. "On the other hand, persistent stress can lead to heart failure, and chronically increased levels of free radicals may be part of the problem here." Daniel C Andersson, Jérémy Fauconnier, Takashi Yamada, Alain Lacampagne, Shi-Jin Zhang, Abram Katz & Håkan Westerblad: "Mitochondrial production of reactive oxygen species contributes to the beta-adrenergic stimulation of mouse cardiomycytes"
A brain imaging study at the U.S. Department of Energy’s (DOE) Brookhaven National Laboratory reveals a subtle difference between ordinary obese subjects and those who compulsively overeat, or binge: In binge eaters but not ordinary obese subjects, the mere sight or smell of favorite foods triggers a spike in dopamine — a brain chemical linked to reward and motivation. The findings — published online on February 24, 2011, in the journal Obesity — suggest that this dopamine spike may play a role in triggering compulsive overeating. Brain scans comparing the effects of methylphenidate plus food stimulation to placebo plus neutral stimulation in obese binge eaters and obese control subjects who were not binge eaters. Since the radiotracer competes with the brain’s natural dopamine to bind to receptors, a weaker signal from the tracer (less red) indicates more dopamine in the brain. The decrease in red in the binge eaters exposed to food and methylphenidate (lower right) compared to the placebo/neutral stimulation condition (lower left) therefore indicates that food stimulation triggered a spike in dopamine levels in these subjects. There was no difference in dopamine levels between these conditions in the non-binge eaters (upper images). “These results identify dopamine neurotransmission, which primes the brain to seek reward, as being of relevance to the neurobiology of binge eating disorder,” said study lead author Gene-Jack Wang, a physician at Brookhaven Lab and the Mount Sinai School of Medicine. Previous studies conducted by Wang’s team have identified a similar dopamine spike in drug-addicted individuals when they were shown images of people taking drugs, as well as other neurochemical similarities between drug addiction and obesity, including a role for dopamine in triggering desire for drugs and/or food. “In earlier studies of normal-weight healthy people who had been food-deprived for 16 hours, we found that dopamine releases were significantly correlated with self-reports of hunger and desire for food. These results provided evidence of a conditioned-cue response to food,” Wang said. In the current study, the researchers suspected that binge-eating obese subjects would show stronger conditioned responses to food stimuli when compared with non-binging obese subjects. “Understanding the neurobiological mechanisms underlying food stimulation might point us toward new ways to help individuals regulate their abnormal eating behaviors,” Wang said. The scientists studied 10 obese people with a clinical diagnosis of binge eating disorder, based on evaluations at St. Luke’s-Roosevelt Hospital, and 8 obese subjects who were not binge eaters. The scientists used positron emission tomography (PET) to scan the subjects’ brains after injecting a radiotracer designed to bind to dopamine receptors in the brain. Because the tracer competes with the brain’s natural dopamine to bind to these receptors, the signal picked up by the PET scanner provides an inverse measure of the brain’s dopamine levels: a strong signal from the bound tracer indicates low levels of natural brain dopamine; a low signal from the tracer indicates high levels of dopamine in the brain. Each subject was scanned four times on two different days to test the effects of food stimulation vs. neutral stimulation with and without pre-administration of a drug known to amplify dopamine signals. The drug, methylphenidate, blocks the reuptake of dopamine from brain synapses, allowing it to linger longer. In scans without methylphenidate, subjects were given a placebo drug. In the food stimulation condition, research subjects’ favorite foods were heated (if appropriate) and waved in front of their mouths and noses so they could smell and even taste tiny amounts swabbed onto their tongues. For the neutral stimulation scans, researchers displayed non-food-related pictures and inanimate objects such as toys and clothing items in close proximity so research subjects could smell them while lying in the scanner. In all cases, research subjects had been fasting for 16 hours prior to scans. Food stimulation with methylphenidate significantly increased dopamine levels in the caudate and putamen regions of the brain in binge eaters but not in the non-binge eaters. Subjects with the most severe binge eating disorder, as assessed by psychological evaluations, had the highest dopamine levels in the caudate. Dopamine levels did not rise significantly in other brain regions or under any other condition (neutral stimulation with or without methylphenidate, or food stimulation without methylphenidate) in either group, and were not correlated with body mass index of the research subjects. Assessments of the levels of receptors for dopamine also did not differ between the two groups. “So the key difference we found between binge eaters and non-binge eating obese subjects was a fairly subtle elevation of dopamine levels in the caudate in the binge eaters in response to food stimulation,” Wang said. “This dopamine response is in a different part of the brain from what we’ve observed in studies of drug addiction, which found dopamine spikes in the brain’s reward center in response to drug-associated cues. The caudate, in contrast, is believed to be involved in reinforcement of action potentially leading to reward, but not in processing of the reward per se. That means this response effectively primes the brain to seek the reward, which is also observed in drug-addicted subjects,” Wang said. Inasmuch as binge eating is not exclusively found in obese individuals, the scientists believe further studies are warranted to assess the neurobiological factors that may differentiate obese and non-obese binge eaters. This study was funded by the National Institutes of Health through the Intramural Program of the National Institute on Alcoholism and Alcohol Abuse and the General Clinical Research Center of Stony Brook University, using infrastructure supported at Brookhaven Lab by DOE’s Office of Science. Researchers at North Carolina State University have developed a cheap and easy method for assembling nanowires, controlling their alignment and density. The researchers hope the findings will foster additional research into a range of device applications using nanowires, from nanoelectronics to nanosensors, especially on unconventional substrates such as rubber, plastic and paper. Aligning nanowires is challenging because, when they are created, the user is faced with a profusion of randomly oriented nanoscale wires that are, by definition, incredibly small. For example, the nanowires are between 10 and 100 nanometers in diameter, whereas a white blood cell is approximately 10,000 nanometers in diameter. Before any practical applications can be pursued, the user must assemble the nanowires in an orderly way. Specifically, users need to align the nanowires in a common direction and define their density – meaning the number of nanowires in a given area. Controlling both alignment and density is commonly called “assembling” the nanowires. In the new method, Zhu’s team deposited the nanowires on a stretched rubber substrate, and then released the tension on the substrate. When the nanowires settled, they aligned at a right angle to where the tension was coming from. Picture a rubber band being stretched to the east and west. If nanowires were placed on the rubber band, and the band was allowed to snap back to its original shape, the nanowires would be oriented to the north and south. The more the rubber substrate is stretched, the more aligned the nanowires will be, and the greater the nanowire density will be. Previous research has presented a number of other methods for assembling nanowires. But the new method offers a number of distinct advantages. “Our method is cost-effective,” says Feng Xu, a Ph.D. student working on this project, “because it is so simple. It can also be used for nanowires synthesized by different methods or processed in different conditions, for instance, silver nanowires synthesized in solution and silicon nanowires synthesized by the vapor-liquid-solid method, as demonstrated in our work.” In addition, the new method can be used in conjunction with previous methods to achieve even better nanowire assembly. The use of a rubber substrate in this method facilitates broad research and manufacturing sectors. For example, a key element of research into stretchable nanoelectronics involves aligning nanowires on a stretchable rubber substrate. Similarly, rubber is also the material used as “stamps” in transfer printing – a critical fabrication method used in manufacturing nanodevices on diverse substrates ranging from silicon to glass to plastic. Zhu notes that the initial step of the method, when the nanowires are first deposited on stretched rubber, sometimes yields an inconsistent degree of nanowire alignment. The team is currently working to understand the fundamental interface mechanics -including adhesion and static friction -between nanowires and rubber substrates, which is expected to lead to a better control of the assembly process and hence a higher yield of the nanowire assembly. The paper, “Strain-Release Assembly of Nanowires on Stretchable Substrates,” was published Feb. 22 in ACS Nano. The paper was co-authored by Zhu, Xu, NC State Ph.D. student John Durham, and Dr. Benjamin Wiley, an assistant professor at Duke University. The research was funded by the National Science Foundation. NC State’s Department of Mechanical and Aerospace Engineering is part of the university’s College of Engineering. Abstract: A simple yet effective method for assembly of highly aligned nanowires (NWs) on stretchable substrates is reported. In this method, NWs were first transferred to a strained stretchable substrate. After the strain was released, the NWs aligned in the transverse direction and the area coverage of the NWs on the substrate increased. This method can be applied to any NWs deposited on a stretchable film and can be repeated multiple times to increase the alignment and density of the NWs. For silver (Ag) and silicon (Si) NWs on poly(dimethylsiloxane) (PDMS) substrates, the probability of NW alignment increased from 29% to 90% for Ag NWs, and from 25% to 88% for Si NWs after two assembly steps; the density increased by 60% and 75% for the Ag and Si NWs, respectively. The large-strain elasticity of the substrate and the static friction between the NWs and the substrate play key roles in this assembly method. We find that a model that takes into account the volume incompressibility of PDMS reliably predicts the degree of NW alignment and NW density. The utility of this assembly method was demonstrated by fabricating a strain sensor array composed of aligned Si NWs on a PDMS substrate, with a device yield of 95%. The growth in the demand of smartphones has highlighted the complexities of wireless communications through problems of reduced sensitivity when the user holds some devices. New research has been investigating this problem, along with developing new solutions to overcome the loss of connectivity. The study by academics in the field of antennas and propagation in the University of Bristol’s Centre for Communications Research (CCR) is published in the journal IEEE Antennas and Wireless Propagation Letters. The paper builds on previous work that analysed multi-antenna or multiple-input multiple-output (MIMO) enabled wireless devices, such as those now synonymous with the latest cellular radio and wireless local area network (LAN) products. The new research rigorously characterised the effects of the antenna being obstructed by the user's hand on the device, when it was in contact with a "thumb phantom" with the dielectric properties of skin and also when operating hands-free. The researchers showed how signal levels change due to obstruction, position and motion, and that signal fluctuations increase significantly, therefore tending to impair service quality. The academics also examined how proximity of the operator's hand affects the antenna's radiation and input characteristics. The results from the study indicate a 100-fold reduction in sensitivity of the device when held, or when the user's thumb is mimicked by phantom material. This de-tuning of the antenna was found not to significantly alter the shape of the radiation pattern, but dramatically worsened the electrical match between the antenna and the electronic circuitry. Mark Beach, Professor of Radio Systems Engineering in the Department of Electrical & Electronic Engineering, said: “Antenna position and user grip on smartphones may lead to obstruction of radio signal paths and antenna detuning. "Research looking at the automated re-tuning of the antenna elements to maintain high efficiency when holding smartphones or similar devices to enhance connection reliability with wireless networks is on going within the CCR." Further tests concluded that providing a gap between the antenna surface and the phantom thumb using a layer of plastic electrical insulator did not restore the matching and operational sensitivity of the phone for the antennas under evaluation. Thus, some phone covers in the market place may not improve the situation. Citation: M Webb, D Gibbins & M Beach, ‘The Effects of User Grip on Smartphone Antenna Performance and Signal Quality’, IEEE Antennas and Wireless Propagation Letters, Vol 9, 2010, pp1053-1056. One in eight Americans will fall prey to Alzheimer's disease at some point in their life, current statistics say. Because Alzheimer's is associated with vascular damage in the brain, many of them will succumb through a painful and potentially fatal stroke. But researchers led by Dr. Dan Frenkel of Tel Aviv University's Department of Neurobiology at the George S. Wise Faculty of Life Sciences are working on a nasally-delivered 2-in-1 vaccine that promises to protect against both Alzheimer's and stroke. The new vaccine repairs vascular damage in the brain by rounding up "troops" from the body's own immune system. And in addition to its prophylactic effect, it can work even when Alzheimer's symptoms are already present. The research on this new technology was recently accepted for publication in the journal Neurobiology of Aging. "Using part of a drug that was previously tested as an influenza drug, we've managed to successfully induce an immune response against amyloid proteins in the blood vessels," says Dr. Frenkel, who collaborated on this project with Prof. Howard L. Weiner of Brigham and Women's Hospital, Harvard Medical School. "In early pre-clinical studies, we've found it can prevent both brain tissue damage and restore cognitive impairment," he adds. Modifying a vaccine technology owned by Glaxo Smith Kline, a multinational drug company, Tel Aviv University's new therapeutic approach activates a natural mechanism in our bodies that fights against vascular damage in the brain. The vaccine, Dr. Frenkel explains, activates macrophages — large proteins in the body that swallow foreign antigens. When the vaccine activates large numbers of these macrophages, they clear away the damaging build-up of waxy amyloid proteins in our brain's vascular system. Animal models showed that once these proteins are cleared from the brain, further damage can be prevented, and existing damage due to a previous stroke can be repaired. A new road to an Alzheimer's cure? Could the breakthrough lead to both a vaccine and a long-sought cure for Alzheimer's disease? "It appears that this could be the case," says Dr. Frenkel, who worked on the study with his doctoral student Veronica Lifshitz and master degree students Ronen Weiss and Tali Benromano. "We've found a way to use the immune response stimulated by this drug to prevent hemorrhagic strokes which lead to permanent brain damage," he says. In the animal models in mice, Dr. Frenkel's team worked with MRI specialist Prof. Yaniv Assaf and his Ph.D. student Tamar Blumenfeld-Katzir of Tel Aviv University's Department of Neurobiology and then with "object recognition" experiments, testing their cognitive functioning both before and after administration of the vaccine. MRI screenings confirmed that, after the vaccine was administered, further vascular damage was prevented, and the object recognition experiments indicated that those animals treated with the new vaccine returned to normal behavior. So far the vaccine has shown no signs of toxicity in animal models. Dr. Frenkel is hopeful that this new approach could lead to a cure, or at least an effective treatment, for the vascular dementia found in 80% of all people with Alzheimer's. Contrary to the view that hearing loss is of only minor importance in old age, study leader Frank Lin, M.D., Ph.D., assistant professor in the Division of Otology at Johns Hopkins University School of Medicine and a core faculty member in the Johns Hopkins Center of Aging and Health, says studies including his own have strongly linked it to other health problems, such as cognitive decline, dementia, and poorer physical functioning. And he notes that relatively little is known about risk factors that drive hearing loss. Our willingness to listen to music is biological trait and related to the neurobiological pathways affecting social affiliation and communication, suggests a recent Finnish study published in the Journal of Human Genetics. Music is listened in all known cultures. Similarities between human and animal song have been detected: both contain a message, an intention that reflects innate emotional state that is interpreted correctly even among different species. In fact, several behavioral features in listening to music are closely related to attachment: lullabies are song to infants to increase their attachment to a parent, and singing or playing music together is based on teamwork and may add group cohesion. In the study of University of Helsinki and Sibelius-Academy, Helsinki, the biological basis of music listening was examined. Data consisted of 31 Finnish families with 437 family members. The participants of the study were 8—93 years old from professional or amateur musicians to participants with no music education. To dissect listening habits further, active and passive listening of music were separately defined and surveyed using questionnaire. Active listening was defined as attentive listening of music, including attending concerts. Passive listening was defined as hearing or listening to music as background music. All participants were tested for musical aptitude using three music tests and a blood sample was taken for DNA analysis. In the study the participants reported weekly average active listening to music of 4.6 hours and passive listening to music of 7.3 hours. It was noted that music education, high music test scores and creativity in music tended to add active music listening. Recent genetic studies have shown familial aggregation of tone deafness, absolute pitch, musical aptitude and creative functions in music. In this study, willingness to listen to music and the level of music education varied in pedigrees. This is one of the first studies where listening to music has been explored at molecular level, and the first study to show association between arginine vasopressin receptor 1A (AVPR1A) gene variants with listening to music. Previously, an association between AVPR1A and musical aptitude has been reported. AVPR1A gene is a gene that has been associated with social communication and attachment behavior in human and other species. The vasopressin homolog increases vocalization in birds and influences on breeding of lizards and fishes. The results suggest biological contribution to the sound perception (here listening to music), provide a molecular evidence of sound or music’s role in social communication, and are providing tools for further studies on gene-culture evolution in music. The study belongs to the larger research project where biological basis of musical aptitude is investigated. The leader of the study is Professor Irma Järvelä from the University of Helsinki. The principal investigator is MSc Liisa Ukkola-Vuoti. The experts in statistical analyses are docent Päivi Onkamo and BSc Jaana Oikkonen from the University of Helsinki. Experts in musical aptitude are Doctor of Music Pirre Raijas and docent Kai Karma from Sibelius-Academy. The study has been published in the Journal of Human Genetics. In 2010, students and archaeologists from the School of History, Archaeology and Religion made a discovery that could change the way we think about the conquest and colonisation of Roman Britain. Geophysical surveys revealed a suburb of monumental buildings squeezed into the ground between Caerleon’s amphitheatre and the River Usk. "At the moment we cannot be certain when these buildings were built or what they were for, but their size and layout suggests that they were public buildings that could have included markets, administrative buildings, bath-houses and perhaps temples. This suburb of civic buildings looks like it should be at the centre of a town or city, but so far there is no evidence for the presence of a large civilian population living around Caerleon," said Dr Peter Guest, Roman archaeologist at Cardiff University. "The biggest is enormous and must be one of the largest buildings known from Roman Britain. We can only guess what it was for, but at the moment we’re working on the idea that it had something to do with a port on the river. Trial trenches excavated last summer may have located the fortress’s main quay, but what the other buildings were for remains a mystery," he added. 2010 was also the final season of excavation in Priory Field, Caerleon, where archaeologists from Cardiff and University College London have been investigating the remains of the legion’s main store or warehouse. This major excavation produced thousands of finds, some of which will provide a remarkable insight into the lives of the soldiers who lived in Caerleon almost 2,000 years ago. Parts of several suits of armour and other military equipment were recovered in Priory Field in 2010, which are being examined in the University’s laboratories as well as in the National Museum Cardiff. Dr Guest will give a special St David’s Day lecture about the discoveries at Caerleon to University staff and students on Tuesday 1 March at 12 o’clock in Redwood lecture theatre (0.21), Redwood Building. No booking is needed – staff and students can turn up on the day. A free public lecture at the Celtic Manor Resort in Newport on the Ides of March (15th) will give members of the public the chance to hear first-hand details from the dig and get up-close with some of the remarkable finds. In the Roman calendar, the Ides of March was a day of festivities and military parades, though we remember it as the day that Julius Caesar was assassinated in 44 BC. Archaeologists from Cardiff University and University College London will use the event to speak about their remarkable discoveries and what it means for Welsh and British history. The talk starts at 7.00pm at the Celtic Manor Resort (Augusta Suite in the Lodge Club House). Free parking is available in the Lodge car park (access via the Resort’s main entrance and Cats Ash Road entrance – follow signs for The Lodge). Booking is essential. To reserve a place for the Celtic Manor event please email publicbookings@cardiff.ac.uk or telephone 02920 876935. The project, funded with £7.2 million by the Engineering and Physical Sciences Research Council (EPSRC) , will look at the way fibre optics are used, and develop new materials and devices to increase internet bandwidth. This will ensure that the web can cope with more broadband subscribers and the increasing use of services such as internet television and music downloads. The Photonics HyperHighway project’s industry partners are BBC Research and Development (www.bbc.co.uk/rd), Fianium (www.fianium.com/) and Oclaro (www.oclaro.com). Researchers at Japan’s National Institute of Advanced Industrial Science and Technology Nano-Systems Research Department have developed full color night vision imaging technology based on new principles. This technology uses high-speed image processing technology and high-sensitivity infrared imaging technology and can be applied to real-time color video images of an object in the dark. With this technology, high security cameras will have increased visibility and will be expected to contribute to a safer society. The growing awareness of crime prevention in recent years has been increasingly in demand, such as security cameras security cameras and surveillance cameras. However, infrared night vision imaging with conventional imaging techniques, display, recording, monochrome, mono-color (monochrome) or false color , and there was a problem in terms of visibility of the image. Therefore, in terms of crime reduction and improved fatigue of the clearance rate monitor watch, and the urgent need to develop a more sophisticated night-vision cameras, imaging technology has a high visibility is desired. AIST researchers have been developing highly sensitive imaging techniques and a high-sensitivity photodetector for many years. The technology accumulated by recent developments have been applied to an infrared imaging device that can produce full color images from night vision. Color imaging technology that AIST has developed includes an infrared night vision that contains much more information than the traditional black and white, mono-color, is much more information compared to the amount of pseudo-color image. For example, captured by security cameras, recorded images, hats and bags of criminals, and if a particular color of clothing is expected to lead to improved crime clearance rate. Because of the increase in the visibility of color images, it should also be possible to reduce the fatigue in watching monitor at night. This technique can also be used for observing animals at night. In an effort to make it easier to build inexpensive, next-generation silicon-based electro-optical chips, which allow computers to move information with light and electricity, a University of Washington photonics professor, Dr. Michael Hochberg and his research team are developing design tools and using commercial nanofabrication tools. A dark-field optical image of a silicon photonic chip is shown in comparison to the size of a penny. Silicon optical chips are critical to the Air Force because of their size, weight, power, rapid cycle time, program risk reduction and the improvements they can offer in data communications, lasers and detectors. The Air Force Office of Scientific Research is funding this effort in silicon photonics called "Optoelectronic Systems Integration in Silicon" at UW's Nanophotonics Lab in Seattle. OpSIS is hosted by UW's Institute for Photonic Integration. Hochberg is in charge of the OpSIS research program, the Nanophotonics Lab and the Institute for Photonic Integration. Hochberg emphasizes that the funding from the Air Force Research Laboratory and AFOSR is a critical component in getting the effort off the ground because it provides both a strong technical validation, and the resources to get started on the project. Unlike most research groups that are designing, building and testing silicon photonic devices or optical chips in-house rather than by using commercial chip fabrication facilities, the UW researchers are using shared infrastructure at the foundry at BAE Systems in Manassas, Virginia. There they are working toward creating high-end, on-shore manufacturing capabilities that will be ultimately made available to the wider community. In the past few years, complex photonic circuitry has not been accessible to researchers because of the expense and a lack of standard processes. The UW researchers are working on system design and validation so they can imitate what's been done in electronics by stabilizing and characterizing some processes so that the transition from photonics to systems can be smooth. "The OpSIS program will help advance the field of silicon photonics by bringing prototyping capability within reach of startup companies and researchers," said Hochberg. "They will provide design rules, device design support and design-flow development so that even non-experts will be able to design and integrate photonics and electronics." Silicon photonics has developed over the last decade, and the transition from using devices to systems is something that has only recently occurred. "The digital electronics revolution over the past 40 years has had a transformative effect on how the Air Force systems are built, and we're hoping to have a similar impact on photonic systems," he said. The researchers' current goal is to work first on test runs for the new optical chips for commercial uses and on developing some software tools that will make the design process easier. AFOSR program manager, Dr. Gernot S. Pomrenke, agrees with Prof. Hochberg. "Integrating silicon photonics will impact Air Force, DoD and commercial avionics," he said. "AFRL has been a leader in developing and supporting this technology over the last two decades and the OpSIS program will help in transitioning silicon photonics into new system capabilities." RUSNANO and The Dow Chemical Company (NYSE: Dow) through its wholly owned subsidiary Dow Europe GmbH have signed a memorandum of understanding to evaluate potential cooperation in fast-growing areas such as energy efficiency, infrastructure, light-weight materials, and life sciences. Through this agreement, both companies will evaluate and define potential joint venture projects to pursue collaborative investments in Russia. The parties have also agreed to exchange technical and commercial information on up-and-coming activities. “Our goal is to develop commercially-meaningful joint projects that help to address key issues in Russia, and leverage Dow technology to support job creation and economic development,” stated Heinz Haller, Executive Vice President and Chief Commercial Officer of The Dow Chemical Company. The Partners have already set priorities for joint potential projects. The emphasis will be on large-scale projects based on nanotechnologies with the aim of attracting cooperation from major corporations and regions in Russia and developing intellectual property. Ongoing cooperation between RUSNANO and The Dow Chemical Company demonstrates potential collaboration to expand American engagement in the emerging economy of Russia. This type of mutually beneficial cooperation reinforces both companies’ commitment to further developing the local domestic market and advancing Russian industry’s integration into the world economy. Joule Unlimited, Inc., pioneer of Liquid Fuel from the Sun™, has supported the high-productivity potential of its production process with the publication of a detailed analysis and model of its breakthrough solar-to-fuels platform. Published by Photosynthesis Research, the peer-reviewed article examines Joule's critical advances in solar capture and conversion, direct product synthesis and continuous product secretion, which collectively form a platform for renewable fuel and chemical production with yields up to 50X greater than the maximum potential of any process requiring biomass. In addition, the analysis counters prior assumptions about the viability of industrial photosynthesis, addressing the barriers overcome by Joule to achieve unprecedented photosynthetic efficiency. "Joule was formed not to improve upon existing biofuel processes, but to create a new and transformational process altogether," said Bill Sims, President and CEO of Joule. "We have channeled photosynthesis, the most productive energy-capture process on earth, at efficiencies previously thought unattainable. At the same time we've eliminated dependence on biomass, the Achilles heel of biofuel production, and the prohibitive costs, processing and logistics it entails. The result is a new paradigm for renewable fuel production with unrivalled productivity targets that are fully supported by actual, measurable gains we've achieved at every layer – from photon capture through product synthesis, secretion, separation and collection." The article, entitled "A New Dawn for Industrial Photosynthesis," quantitatively affirms the advantages of Joule's direct conversion process as compared to the indirect production of fuel from biomass, including algae. Though both processes aim to convert solar energy into fuel, the latter method requires the costly culturing, harvesting and processing of algal biomass – a multi-step intermediate stage that Joule's process avoids. Moreover, Joule's process directly yields hydrocarbons that are fungible with existing diesel infrastructure, unlike the biodiesel product that is produced from algal oil. • Based on empirical measurements, Joule can directly produce 15,000 gallons of diesel per acre annually, as compared to 3,000 gallons of biodiesel produced indirectly from algae. • The solar-to-product conversion efficiency of Joule's direct, continuous process for producing diesel, ethanol and chemicals is between 5 and 50X greater than any biomass-dependent process, and gains additional efficiencies by avoiding downstream refining. • Joule's combined advances in genome engineering, solar capture and bioprocessing result in photosynthetic conversion efficiency of more than 7% relative to available yearly solar energy striking the ground, many times greater than prior industry assumptions. "In contrast to research of the past, we have shown that photosynthesis is the superior platform technology for direct, renewable fuel production at the volumes and costs required to supplant fossil fuels," said Dan Robertson, PhD, co-author of the article and Senior Vice President of Biological Sciences at Joule. "The engineering of a photosynthetic microorganism to directly synthesize an infrastructure-compatible product, and continuously secrete that product, represents a landmark in industrial bioprocessing. The process technology is equally unique in that a highly-efficient, low-cost SolarConverter® system enables unprecedented productivities, as fully explained in our analysis and now being demonstrated at pilot scale." "Joule has already delivered on its vision as the first commercial effort to combine the required biological advances with radical improvement in cost and robustness of a system for industrial production," said George Church, PhD, renowned geneticist and Chairman of Joule's technical advisory board, who also contributed to the article. "This is the holistic systems approach that will finally capitalize on solar energy for liquid fuel production at meaningful, economical scale." Joule is pioneering the production of Liquid Fuel from the Sun™, surpassing today's barriers to abundant, sustainable, cost-competitive supply. Its transformational Helioculture™ platform converts sunlight and waste CO2 directly into liquid fuels in a continuous process that is not limited by costly biomass intermediates, processing or use of precious natural resources. This platform can yield renewable diesel fuel in unprecedented volumes with a fraction of the land use incurred by current methods, leapfrogging biomass-dependent approaches and eliminating the economic and environmental disadvantages of fossil fuels. Founded in 2007 by Flagship VentureLabs, Joule is privately held and headquartered in Cambridge, Massachusetts. Additional information is available at www.jouleunlimited.com. Floating solar panels have been developed by a Franco-Israeli partnership, this innovative solar power technology introduces a new paradigm in energy production. Solar power plays a dominant role in the world-wide effort to reduce greenhouse gases, it is considered a clean energy and is an efficient source of electricity. Yet several obstacles have been undermining the expansion of this sector and many of its actors are looking for a new approach towards the markets. The project results from a collaboration between Solaris Synergy from Israel and the EDF Group from France. EUREKA provided the supporting platform which allowed to enhance both companies' partnership. After receiving the "EUREKA label" the project, called AQUASUN, found also support from the Israeli Ministry of Industry, Trade and Labor. "We are very pleased with the collaborative dimension of the project", says Dr. Elyakim Kassel, coordinator of the AQUASUN project and business development manager at Solaris Synergy. Soon after the design phase was over, at the end of March 2010, the fabrication of a prototype began and the team is now aiming to launch the implementation phase in September 2011. The tests will take place at Cadarache, in the South East of France, the site having a privileged position on the French electric grid and being close to a local hydro-electric facility providing the water surface to be used for the installation of the system. It will operate on-site during a period of nine months, while assessing the system's performances and productivity through seasonal changes and various water levels. The research team members believe that by June 2012, they will have all the information required to allow the technology's entry on the market. As even leading photovoltaic companies struggle to find land on which to install solar power plants, the project team identified the almost untouched potential of solar installations on water. The water basins, on which the plants could be built, are not natural reserves, tourists' resorts or open sea; rather they are industrial water basins already in use for other purposes. By that, it is assured that the new solar plants will not have a negative impact on natural landscapes. "It's a win-win situation", declares Dr. Kassel, "since there are many water reservoirs with energy, industrial or agricultural uses that are open for energy production use". After solving the question of space, the team also took on the problem of cost. "It sounds magical to combine sun and water to produce electricity, but we also have to prove that it carries a financial logic for the long run", explains Dr. Kassel. The developers were able to reduce the costs linked to the implementation of the technology by two means. First they reduced the quantity of solar cells used thanks to a sun energy concentration system based on mirrors, while keeping steady the amount of power produced. Still for the purpose of making the technology efficient and ready to market, the system is designed in such way that on a solar platform it is possible to assemble as many identical modules as needed for the power rating desired. Each module produces a standard amount of 200 kiloWatt electricity, and more power can be achieved by simply adding more modules to the plant. The team also worked on the environemental impact of the technology. It works in fact as a breathing surface through which oxygen can penetrate to the water. This feature ensures that sufficient oxygen will maintain the underwater life of plants and animals. Dr. Kassel adds: "One of the implementation phase's goals is to closely monitor the possible effects of this new technology on the environment with the help of specialists" and "a preliminary check shows no detrimental environmental impact on water quality, flora or fauna. Our choices of materials were always made with this concern in mind". The project was featured at the 4th International Eilat-Eilot Renewable Energy Conference in Israel giving the public the occasion to observe the functioning of the first floating concentrated photovoltaic system. According to Solaris Synergy's CEO, Yossi Fisher, the installation in Eilat has been a milestone, opening the way for "many future implementations in Israel and throughout the world". Dr. Kassel sees to his project a last benefit: "Today, each country must consider the best resources it has in order to produce clean energy. For example: hydroelectric power is good where there are waterfalls, geothermic is productive for countries with thermal springs and solar power is very efficient where there is sun. Our system could be of great use in places that are exposed to sun, but not necessarily have sufficient natural water. Even dry countries, such as Israel or the North African countries, have industrial waters that are not rain dependent. This fact makes the floating solar power plant a reliable method for them to produce renewable energy". 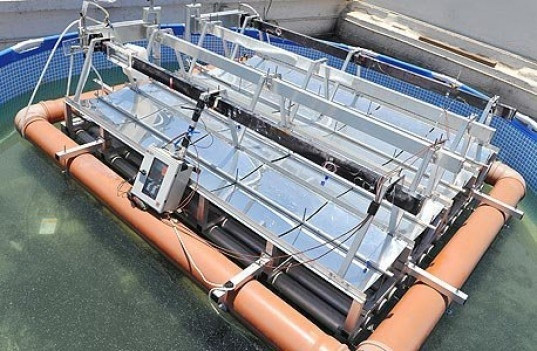 Solaris Synergy installed its first live floating concentrated photovoltaic (F-CPV) system connecting to the Israel Electric Corporation (IEC) grid. The system is based at the Arava Institute for Environmental Studies' Center for Renewable Energy and Energy Conservation located on Kibbutz Ketura, 30km north of the Israeli resort town of Eilat. The project is part of Capital Nature Experimentum, a full-service verification and inspection center for new technologies developed by renewable energy companies. "This installation is a milestone for us, and we're confident that it's just the first of many future Solaris implementations in Israel and throughout the world," said Solaris Synergy CEO Yossi Fisher. The European Space Agency has backed a $643 million (£400 million) mission to study extra-solar planets, led by UCL (University College London). A key objective of the mission is to look for signs of life in planets which are orbiting stars nearby our Sun. EChO - the Exoplanet Characterisation Observatory - is led by Dr Giovanna Tinetti, from the UCL Department of Physics and Astronomy, and is supported by over 150 of Europe's top astronomers. It will consist of a 1.2 metre telescope designed to carry out spectroscopy of the atmospheres of a range of extra solar planets, from giant gas planets (similar to Jupiter in our own Solar System) down to terrestrial planets in the habitable zone of some stars. The telescope should be launched some time between 2020 and 2022, and will look at the atmospheres of planets that may be orbiting in the "habitable zone" of their stars, where water can exist as a liquid. "This is tremendously exciting news," said Dr Tinetti. "One of the key aims of our mission is to see if we can detect molecules such as ozone and carbon dioxide in the atmospheres of planets not much bigger than our Earth. These molecules are key biomarkers - signs that life might be, or might have been, present." EChO will cost about 400 million pounds, and was one of nearly 50 mission proposals made to the European Space Agency. "We had to overcome really tough competition to get selected for further study and possible launch," Dr Tinetti explained. Looking ahead to the next decade of scientific exploration, ESA has on February 25th selected four candidates for a medium-class mission that will launch in the period 2020-22. The candidates cover very different areas of scientific research, ranging from investigations of black holes and general relativity to near-Earth asteroid sample return and studies of planets orbiting distant stars. Famed especially for the excellence of its peacekeepers and ice hockey players, Canada's water experts are now increasingly needed to help countries elsewhere brace for drought, flood and unsafe water problems looming on a 15 to 20 year horizon. Within a single generation, recent studies show, water demand in many countries will exceed supply by an estimated 40%, with one-third of humanity having half the water required for life's basics. In flood-prone places, meanwhile, catastrophic flood events normally expected once a century - similar to those recently witnessed in Pakistan and Australia - can now be expected every 20 years instead. This photo shows an innovative road construction where storm runoff is captured into a grass swale in Auckland, New Zealand. The anticipated crises create a fast-growing need for technologies and services to discover, manage, filter, disinfect and/or desalinate water, improve infrastructure and distribution, mitigate flood damage and reduce water consumption by households, industry and agriculture - the biggest water user by far at 71% worldwide. And Canada is well positioned to mobilize and share worldwide its extensive experience gained stewarding 9% of the world's freshwater supply. Representing an important step in that process, some 300 scientists, policy-makers, economists and other stakeholders convene in Ottawa Mon. Feb. 28 to Thurs. March 3 for an international meeting hosted by the Canadian Water Network (CWN) showcasing latest world research findings as well as proven news tools, ideas and best practices for optimizing water management. "Climate change will affect all societies and ecosystems most profoundly through the medium of water but there is no other way to generalize the crises ahead. At unpredictable times, too much water will arrive in some places and too little in others," says Zafar Adeel, Chair of UN Water, which coordinates water-related efforts of 28 United Nations organizations and agencies. He is also Director of the United Nations University's Canadian-based Institute for Water, Environment and Health. "Water is a local issue demanding responses tailored to specific locations. Sadly, most communities, especially in developing countries, are ill-prepared to adjust to looming new realities. Canadian expertise in water management is greatly needed." This is a photo of an innovative parking space in Auckland, New Zealand. Runoff is infiltrated, plants absorb nutrient and soils and sediments are detained. "Canadians can do well by doing good," he adds. If the prediction of a $1 trillion water industry in 2020 proves correct (it is estimated today at $400 billion per year), it would be about one-fifth as large as today's global $4.5 trillion construction industry. "We need to brace for what could easily be humanity's greatest short-term challenges," says Margaret Catley-Carlson, a former senior official with both the Canadian government and at the United Nations, a renowned global authority on water issues, and a CWN director. She cites US-led research that, by 2030, global water demand will be 40 percent greater than today's "accessible, reliable, environmentally sustainable supply," which constitutes a fraction of the absolute raw freshwater available in nature. Filling the gap with supply-side measures only, however, requires an estimated $200 billion per year; an approach that both raises supply and lowers demand would require $50 to $60 billion. Says Nicholas Parker, Chairman of the Cleantech group: "What people don't often realize is how much water there is in everything we make and buy, from t-shirts to wine." "Virtual water" describes the volume "embedded" in a product during its production. A desktop computer, for example, requires 1.5 tonnes (1,500 litres) of water; a pair of denim jeans up to 6 tonnes; a kilogram of wheat 1 tonne; a kilo of chicken 3 to 4 tonnes; a kilo of beef 15 to 30 tonnes." Annual global trade in "virtual water" today is said to exceed 800 billion tonnes, the equivalent of 10 Nile Rivers. And the financial world is looking ahead to the bottom-line impacts of a water-constrained world. Institutional investors managing tens of trillions of dollars are pointedly asking businesses for data about their vulnerability to potential water supply difficulties. "Canada's relatively abundant water supply will surely be an asset in future as precious as oil was in the 20th Century," says Mr. Parker. "It must be managed carefully to ensure it can be harvested sustainably in perpetuity, supporting the well-being of all members of the world community." The surface of Canada covered by freshwater lakes and rivers roughly equals the entire area of Spain, Germany and Belgium combined. However, says Bernadette Conant, Executive Director of the Canadian Water Network: "It is critical that Canada's relative 'abundance' not make Canadians complacent on the water supply issue, nor divert attention from the critical importance of water quality." "The need to manage this resource effectively is common to every country on Earth." "Water is not distributed evenly across Canada, nor are its people, industry and environmental needs. Much of Canada's water is frozen or flows north, away from populated areas, and just 1% of its supply is renewed each year by precipitation. The quality and security of that supply underpin public and environmental health, as well as the economy." Some regions like western Canada already experience water shortages, she says, while developed areas in the east will face supply shortages due to insufficient planning and management, and elsewhere flooding will be the biggest problem. This innovative parking design absorbs contaminated runoff and detains and delays storm water runoff inNorth Vancouver. "Canada is a vast country and will experience the broad gamut of water challenges, creating the opportunity to further develop and share our broad expertise in how best to deal with them. The dire forecasts are not inevitable if we apply well-demonstrated water management knowledge, technology and social innovations." Conference speaker Hans Schreier of the University of British Columbia will present research buttressing the need for flood-prone areas to brace for more frequent disaster - adaptation to which represents another potential opportunity for Canada to help internationally. In many vulnerable places worldwide, catastrophic flood levels normally expected once a century - similar to those recently witnessed in Pakistan and Australia - can now be expected every 20 years instead, he says. A number of northern British Columbia communities - the town of Smithers, for example - have endured "1 in 100 year" floods three times in the past two decades - disasters that underscore the need for new techniques and ideas in municipal planning and road design. "Our water infrastructure is not designed to cope with this new reality," says Dr. Schreier. Indeed, according to fellow conference speaker Robert Tremblay, Research Director of the Insurance Bureau of Canada, claims resulting from extreme weather have increased 20-fold in the past 30 years and flood-related claims now consistently exceed fire and wind insurance claims every year. Dr. Schreier recommends vulnerable communities everywhere follow the example of several municipalities and adopt a new approach to road and street design. Curbs, drains and impermeable surfaces are being replaced where possible with grassy shoulder depressions or swales that collect and absorb rainwater while directing excess runoff into constructed wetlands or storm water retention ponds. Not only does this approach mitigate flood damage, polluted runoff normally drained via pipes into lakes and rivers is instead filtered and cleaned as it sinks through the ground, helping compensate the extensive loss of wetlands to development. Other low-cost innovations include home driveway designs and materials that allow most precipitation to be absorbed instead of running onto streets and roads. Another idea is to allow the intentional flooding of low-lying parks, farm fields or golf course for a week or two during major rain events to prevent flooding in urban areas. Says Dr. Schreier: "It is cheaper to compensate landowners than to scale up municipal water infrastructure." American microbiologist Rita Colwell, Chief Scientist at Canon US Life Sciences, former Director of the US National Science Foundation, and winner of the 2010 Stockholm Water Prize. She warns that "extreme weather events associated with global warming can lead to a breakdown in sanitation, sewage treatment plants and water treatment systems." "Indeed, because the bacteria are part of the natural environment, we could again begin to see epidemics of cholera in the U.S. and in Europe that we haven't seen in almost 100 years," she adds. "To prepare, we need to understand the ecology of these infective agents in the natural environment as part of the environment that we humans inhabit in order to explain, understand, and prevent infectious diseases." Judy Isaac-Renton, Professor, University of British Columbia, and Director, Public Health Laboratory Director, British Columbia Centre for Disease Control. She and a team of scientists working in the labs at BCCDC, along with social scientists and other partners across Canada, are pioneering the application of genetic science to water quality assessment. "We have very little knowledge of microbial life in water, but with new genetic tools we can analyze all the DNA in a water sample to get a rapid assessment of health risks," she says. "Until now, safe water testing has relied on a century-old technology of growing bacteria in a lab to see whether anything harmful is there. It's effective but slow and tedious. The new 'meta-genomics' technology offers not only the possibility of rapid safety assessments, but also the ability to detect and determine the origins of contaminants in waterways." Scientist Pierre Payment of Quebec's Institut National de la Recherche Scientifique, leader of a group of national and international experts developing a novel way to monitor and control the risk of waterborne diseases due to harmful microbes. He will describe the possibilities for Quantitative Microbial Risk Assessment (QMRA), a mathematical tool to assess the potential for water treatment facilities, to reach a health target set by Health Canada. The currently proposed target is set at less than 1 infection per 10, 000 people per year. The models can be integrated in water treatment facilities as in-line software systems and provide continuous feedback as to the quality of the distributed water. QMRA also allows for sophisticated "what if" scenarios to compare various treatment technologies and chose the best, most cost-effective combinations to reach the health target. US EPA researcher Nicholas J. Ashbolt. He says "water conservation could easily reduce demand from households by 70% compared to today's usage in countries like the USA, through innovations available that radically reduce water used to flush toilets, wash clothes and irrigate gardens." "The ever expanding demand for urban, water-based sanitation services can be reduced by adopting dry, or low-water-use, devices such as dry composting toilets with urine separation systems. These technologies divert urine for reuse in agriculture and convert the remaining waste on-site into an organic compost that can enrich soil. Operating basically like garden compost heaps, these units employ aerobic microbes to break down human waste into a non-toxic, nutrient-rich substance." "These techniques can be used safely, even in fairly dense urban settings, as exemplified by installations at the Gebers Housing Project in a suburb of Stockholm and many other pilot projects." Water-saving fixtures installed in U.S. households in 1998 alone save an estimated 166,000 cubic meters of water daily and more than $33.6 million per year. Anna Warwick Sears of the Okanagan Basin Water Board in British Columbia, where water supply worries are rising due to rapid population growth. "Climate change requires new ways of thinking and co-operation between water users," she says. "Even in one of the driest regions of Canada, our water systems were built under a paradigm of unlimited supply." Ms Sears will address how her region is preparing to cope with the coming 'known unknowns' of climate impacts on water. Metallic Molecules To Nanotubes: Spread Out! 2011, The Year of the Higgs?